HR is the new IT! One of the UK's brightest human resource managers has been honoured by Manchester Metropolitan University. David Fairhurst, who was voted HR director of the year 2006 by readers of HR Magazine, and last month secured number 1 position in the Personnel Today Top-40 HR Power Players list, received an honorary doctorate in business administration from MMU Business School. This is the first time a human resources professional has been honoured in this way by MMU, which is a clear signal that the contribution of people in organisations and the wider economy is being fully recognised. Making reference to speeches by Gordon Brown and David Cameron encouraging employers to invest more in the development of their staff, Wigan-born Fairhurst told the audience at MMU's graduation ceremony at Bridgewater Hall, Manchester: "Human resources is a discipline which I and many others believe could change the lives of people in the 21st Century as much as mechanisation, automation and information technology did in the 19th and 20th Centuries. "For far too long human potential has been underestimated by the managers of too many organisations. Unlock that potential, however, and results can be amazing." Fairhurst, 39, has enjoyed a rich and varied career in HR including being the youngest group manager at H J Heinz Ltd. As director of recruitment and leadership planning for SmithKline Beecham, he took the company to 'European Employer of Choice' status in its sector. After five years as corporate HR director at Tesco, Fairhurst joined McDonald's Restaurants Ltd in 2005 where he is now senior vice president, chief people officer for Northern Europe. Here he has vowed to improve the confidence of staff and help them develop "skills for life". In addition he aims to dispel the negative myths surrounding jobs in McDonald's and the hospitality and service sector as a whole. He recently told a conference that the Olympics in 2012 would showcase the strength of the UK service sector to the world. Professor Huw Morris, Dean of MMU Business School said: "HR management is about getting the best out of employees for the benefit not only of the business but for the employees themselves. "David's track record in management is tremendous and to take on a tough job like McDonald's is a testament to his drive and resourcefulness." Fairhurst is chair of the new Centre for Professional Personnel and Development within MMUBS and a keen supporter of the University and the human resource management profession. "In all that he has done to date and in his plans for the future, David is an excellent role model for staff, students within the University and to the growing number of alumni from the institution," added Professor Morris. Fairhurst is married with two children and when time permits enjoys supporting his home town rugby and football team, Wigan. Accepting the award, he said: "To be recognised for one's work is humbling. And it is doubly so to be recognised by a university where I have studied, based in a region which has played such a pivotal role in my life and career." 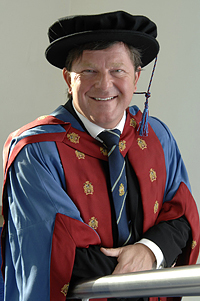 David Fairhurst received his honorary degree at the Manchester Metropolitan University Business School graduation ceremony at the Bridgewater Hall, Manchester on July 17. Manchester Metropolitan University Business School is one of the largest and most well-respected business schools in the UK, offering 5,000 full-time students and part-time professionals a vast range of courses in accounting and finance, management, human resources, retail and marketing, PR, and information technology in addition to AMBA-accredited MBAs programmes. It is one of seven modern universities to be AMBA accredited. And one of only 12 institutions out of 300 which run Chartered Institute of Personnel and Development (CIPD)programmes to be a Centre of Excellence for the Chartered Institute of Personnel and Development. MMUBS' Human Resource Management Division enjoys an excellent national and international reputation for professional and academic expertise in the related areas of human resource management, human resource development, employee relations, business ethics, organisation behaviour, management development and organisation change and development. The Division is distinctive for its links to business and professional bodies, most notably the CIPD and the Chartered Management Institute as well as its expertise in Action Learning and Facilitation. David Fairhurst has a masters degree in human resource management from Manchester Metropolitan University and is a chartered fellow of the Chartered Institute of Personnel and Development. He is also a fellow of the Royal Society of Arts, an honorary fellow of Lancaster University and is vice-chairman of the Sector Skills Council, People.